Section 4A(ii) has been subject to much debate as to whether a service that is subject to withholding tax under s 109B of the Income Tax Act (ITA) 1967 needs to be in technical in nature or not. What made a service “technical” was also the subject of much dispute. not limiting the scope to technical management or administration of any scientific, industrial or commercial undertaking, venture, project or scheme. The proposed change aims to reflect case law decisions that have widened the definition of services under s 4A to include both technical and non-technical services. It was held in EPM Inc v Ketua Pengarah Hasil Dalam Negeri (2001) MSTC 3,306 (Special Commissioners) and Esso Production Malaysia Inc v Ketua Pengarah Hasil Dalam Negeri (2003) MSTC 4,016 that s 4A of the ITA 1967 covers both technical and non-technical assistance or services in connection with any scientific, industrial or commercial undertaking, venture, project or scheme. Section 4A(ii) of the ITA 1967 is to be read disjunctively, and hence, it is applicable to technical advice, technical and non-technical assistance and technical and non-technical services. The final changes made to reduce the impact that arose from the initial change – the scope, while widened to include non-technical services, it is limited to the management or administration of any scientific, industrial or commercial undertaking, venture, project or scheme. Pursuant to the above, s 15A, 109B and Schedule 1 of the ITA 1967 were amended to reflect the new scope. 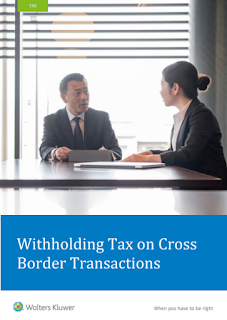 Wolters Kluwer’s Withholding Tax on Cross Border Transactions workshop aims to provide finance and accounting leaders, this programme aims to provide clarity withholding tax concepts, calculations and best practices on reporting. It covers the changes made to withholding tax rules due to Budget 2019 and issuance of a new public ruling on the special classes of income tax. Knowledge on minimising withholding tax exposure and avoiding costly tax penalties.